Welcome to the SCM Safety Newsletter, Spring 2017 edition. This newsletter is here to provide you with information that is useful as well as for all of us to stay informed. We really enjoy hearing back from you, with comments, questions and as always – ways we can improve. As opposed to Hazardous Communication – that does not provide improvement and effective communication, our goal is to bring you what you want to know, and maybe help you to think about safety in a new way. If you have questions, comments or would like to help us improve, you can always leave us a note through this link. We have tried a new format in this newsletter. Please give us any feedback, your comments are always welcome. Read on to play our Safety Quiz, learn more from Ron’s Blog Corner, and Catch up on Safety News. What do you know about Earthquakes and Safety? April is Earthquake Preparedness Month, which is especially meaningful in the San Francisco, CA Bay Area where SCM is headquartered. April 18th is the 111th anniversary of the Great San Francisco Earthquake of 1906! Earthquakes occur around the world, and are not centralized to the West Coast. With that in mind, it becomes important to be prepared and know what to do should a serious quake occur. What do you know about Earthquakes, preparing to be safe, and actions to take during the event? Test yourself. Contact us for the answers. And check below in our list of links to find some more information specific to this quiz! 1. The room is rocking, the overhead lights are swinging, and someone shouts, “It’s an earthquake!” What’s recommended as the first thing to do? A. Run out of the building. B. Take shelter in a doorway. C. Crawl under your desk. D. Just sit there, it will be over soon. 2. Your business has a warehouse, with shelving reaching up about 12 feet high. Various materials, boxes and items are stored on these shelves. What are some ways you can minimize the risk of these items being being damaged during an earthquake? A. Store some of the heavier items on the lower shelves. B. Have the materials on the shelves be interlocking. C. Shrink wrap the materials on the shelves with plastic wrap. D. Limit how high the materials can be stacked so that nothing can fall off. 3. What are the recommended actions if you are outside during an earthquake? A. Carefully move away from buildings and/or any power lines, crouch down and cover your head. B. Run to a building and lean against a wall, covering your head. C. Stand under a tree. D. Get in your car and drive home as quickly as you can. 4. What are the recommended actions if an earthquake occurs while you are driving? A. Stop the car where you are. Get out and crouch in the road, covering your head. B. Start slowing down, carefully pull over to the side in an open area when it is safe to do so, stop the car and wait inside with your seat belt fastened until the quaking stops. C. Slow down, and pull over under an overpass. Stop the car and wait in the car until the shaking stops. D. Keep driving. It won’t matter. 5. The time to prepare for an earthquake is before one happens. What of the following is not a recommended item for an earthquake preparation kit? A. A First Aid kit. E. This is a trick question. All of these things are recommended. We’ll help you out with this one. Alaska led the US with 1,575 earthquakes in 2015. Oklahoma was number 2, with 888. Wyoming was a distant 3rd place with 198, and Nevada took 4th place with 172. California was in 5th place with 130. Kansas had 60, putting them in 6th place. Surprisingly, Hawaii was in 7th place with only 53 earthquakes. Here is the link to see for yourself: USGS List of earthquakes by state. And for some links to OSHA and CDC info on earthquake safety, see links in the “News You Can Use” section. Talking to a Help Desk person one time about an issue we were having with our computers we found that the problem was, according to the IT person we were talking to, not a problem with the software or hardware, but rather we were not looking in the right place for the information we needed. So, basically, the problems we were having were our fault, not the computer’s. Jokingly, the IT person told us that this was a PICNIC situation – Problem In Chair, Not In Computer. Now, we have to admit, that’s a pretty funny acronym. However, we think that PICNIC is also a pretty good example of how people thinking about human performance and, unfortunately, a common mistake people when they are dealing with the problem of “human error.” We often think of human performance in terms of an “either/or” – either the event was caused by an action or by the conditions the person was in (equipment, culture, etc.). In the case of PICNIC, either the problem is in the chair (the person) or in the computer (conditions). This makes investigation and analysis easy, right? All we have to do is look at the incident, place all the human failures on one side and all the equipment failures on the other side and whichever side is the biggest is the one to blame and should be dealt with accordingly. This line of thinking is consistent with most models of safety management, most notably seen in Heinrich’s 88-10-2 theory (LINK), where 88% of all accidents are caused by unsafe acts, 10% are caused by unsafe conditions, and 2% are just “acts of god” (unpreventable, according to Heinrich). The implication looking at this data is that our systems (organizations, environments, factories, jobsites, whatever you want to call it) are basically safe. It’s all these unreliable, unsafe people who make things unsafe by not following rules and procedures. Therefore, we need interventions designed to change this disruptive, unsafe behavior. And you see this played out in the safety world with many of the interventions we tend to focus on, such as compliance, training, disciplinary procedures, reward and incentive structures, culture initiatives, hearts and minds initiatives, and behavior-based safety. As an indicator of the dominance of the focus on behavior in safety, look at the difference in group memberships in the LinkedIn groups for Safety in Design (624, at the time of this writing) and Behavior-Based Safety (12,634, at the time of this writing). Obviously this is not a scientific analysis, but it is an indicator of how representative the PICNIC idea is in the everyday practice of safety professionals. But is the model that underlies PICNIC true? Well, to answer this question, let’s think about it. For it to be true that we can differentiate and analyze human acts separate from the conditions in which those actions take place. Basically, the human act must not be influenced by the condition and vice versa. If the action is influenced by the condition (or if the human influences their environment) then looking at them separately loses its’ value because you’re not looking at each in a natural way, as they exist in the environment in which the event occurred. When we look at human performance closely this is exactly what we find – you cannot meaningfully separate the human’s behavior from the environment they are in. People naturally adapt their behavior to the environment they are in, adopting a strategy that they believe will help them achieve their goals. This includes making adjustments both to their behavior and adjustments to the conditions they are in. This is the essence of sociotechnical systems. The interactions between the people and their environment create behavior that you could not predict if you look at either separately. Further, these performance adjustments may also be separated from the event both in space and time, meaning that a traditional, linear investigation will not easily identify them. The implication here is that traditional interventions may not be as effective as we’d like them to be. We need to change the way that we think about safety and human error. Rather than focusing on individual parts of a system, such as the people or the conditions, we need to understand how the people interact with the system and vice versa. Traditional methods of safety management are not well suited for this task because they tend to be based on the idea that we can easily predict the safest ways to do every job, but that’s not necessarily possible in complex systems (spoiler alert – almost any system that involves people is going to be a complex system). We need interventions not based on reductionist thinking, but rather based on understanding relationships, both relationships amongst people, but also relationships between people and their environment. We need interventions that help us understand not just failure, but normal work, where these performance adjustments are taking place. Most importantly, we need interventions that see workers as a solution to harness, rather than a problem to control, because it is these very same performance adjustments that are leading to success in our organizations most of the time. This change in thinking may require the rethinking of some interventions (e.g. training), the retooling or even abandonment of others (e.g. behavior-based safety). But without change it is clear that safety management is quickly falling behind the curve in its’ ability to provide effective interventions in an increasingly complex and dynamic world. Safety Differently – A New View of Excellence on June 20th at 4:30 PM. OSHA has announced their new promotion for a Safe and Sound Workplace based on rising occupational-related fatality rates in Kansas, Nebraska and Missouri. Read more about it through this link. OSHA has released a final rule to Update the General Industry Walking-Working Surface and Fall Protection standards. The purpose of the final rule is to help employers by providing greater flexibility in choosing a fall protection system. You can rad more about the final rule by following this link. OSHA also has announced that June 12 – 18 is Safe and Sound Week. Check out the promotion here. OSHA’s guidance during earthquakes can be found here. CDC launches new campaign on Opioid Addiction in the Workplace. To learn more, connect through this link. CDC’s recommendations for emergency survival kits can be found on this site. 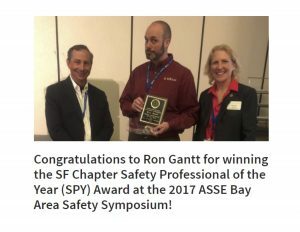 Chapter’sSafety Professional of the Year. Just to show off a little, here’s his picture! That’s Ron in the middle. He was nominated by SCM’s Senior Project Manager, and the chapter’s President, David Paoletta. Remember, you cal always call the SCM office at 925-362-2265 or respond to this email to register as well. Do you have more than 1 person to send to training? Call us for multiple attendee rates!